Somebody please tell me HOW is it April? Please don't go on to explain how time is a continuous and intangible phenomenon that always moves forward regardless of what is happening around us. Please just don't tell me that because I know. I know it just moves. Time keeps moving even if I decide not too. It's just so hard to believe that 2013 is already more than 3 months old. It already grew out of its new year resolutions and never wants to sleep! The only occasion when I think time actually stands still for just a little bit is when I'm baking. Or maybe it's just that my brain slows down. It's therapy, but it's edible, which makes it twicely therapeutic. Being in the kitchen with a big mixing bowl, a wooden spoon and a warm oven is like an off-switch for my brain. The only things I see are chocolate bits floating through the skies and brown sugar clouds. It's my happy place. Something I make nearly every week is a batch of granola bars. They are simple and quick to make and so satisfying as a snack anytime of day. 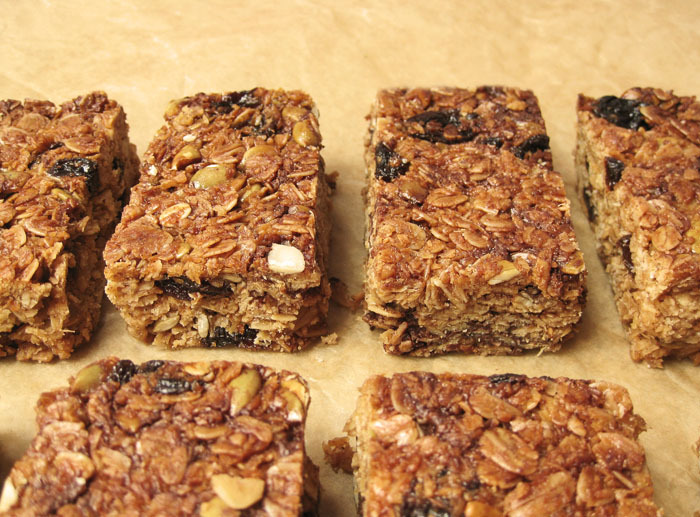 There are a few things that can take the "bar" away from your granola bars. A major issue with making these guys at home is that they tend not to hold together without buckets of sugar. Everything may look nice and solid in the pan, but as soon as you take your knife to the block it can just crumble down into rubble. Still a very delicious snack, but not the bars that we are after. 1. Stick to the recipe if you want your bars to stick! Having the right proportion of sugar/honey to dry ingredients is essential. 2. Use the right type of oats. Recipes that use a proportion of quick-cooking or ground oats use them for a reason. Broken down oats will take up moisture readily and have their binding power exposed. The soluble fibers and proteins within oats are powerful binding agents that help to hold the mixture together. 3. Pack it in. Really use all your might to get the sticky granola mixture packed very tightly in the pan before baking it. This will help the oats stick together well. Halfway during baking, and even after it is fully baked, I like to press firmly on the mixture with the back of a spatula to pack it down again in case it has puffed up a bit. 4. Give it enough heat. Make sure to bake your granola mixture thoroughly to help the binding compounds release and then reset. 5. Cool completely before slicing. When the granola slab is still warm, molecules are still moving and full of energy just like a warm roast beef. You need to let it rest so that the juices don't leak out. In the case of these granola bars, you need to let them cool completely to let the starches gelatinize and set up firmly (like letting the glue dry). Even refrigerating for and hour will help to get clean slices. Either way, I still think it's a brilliant idea. Preheat your oven to 325 degrees F. Line an 8-inch square baking dish with parchment paper and set aside. In a large bowl, stir together both oats, coconut and cinnamon. Add raisins and pumpkin seeds and toss to combine; set aside. In a small saucepan over low heat, stir together honey, brown sugar, butter and milk until butter is completely melted and mixture is smooth. Increase heat and bring mixture to a boil. Cook at a boil for one minute and then pour over the oat mixture. Stir everything together until all of the dry ingredients are well coated with the honey mixture. It will be sticky. Sprinkle salt over mixture while stirring so that it is evenly distributed. Dump oat mixture into the prepared baking dish. With clean, slightly oiled hands (or the back of a spatula or bottom of a mug), press the oat mixture very firmly into the pan until it is tight. Bak for 35 to 40 minutes, or until evenly browned. The baked granola will still feel very slightly soft in the center even after it is baked, but will harden as it cools. 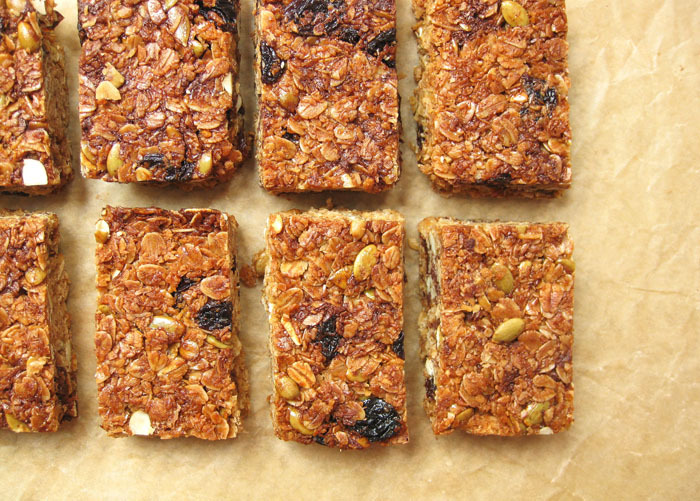 I'm always looking for new granola bar recipes, and these look delicious! I'd love one right now! Yes that would work! It achieves the same effect by exposing the interior of the oats. I made them this way a few weeks ago by pulsing rolled oats a few times in a coffee grinder - enough to give me a total of 1/2 cup. 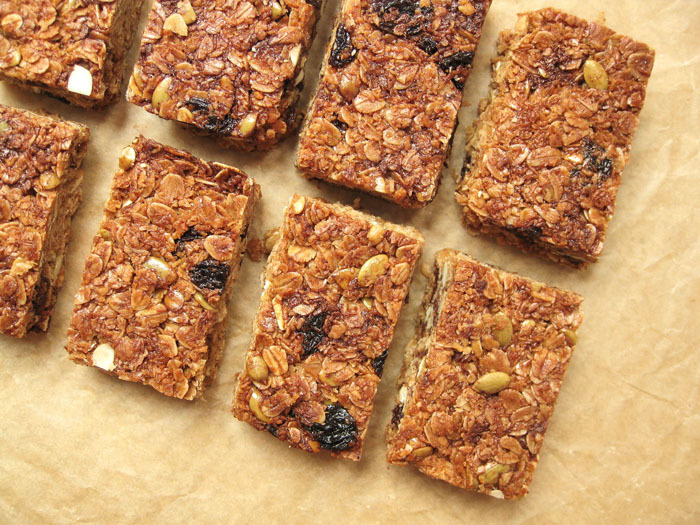 Those look so much better than store-bought granola bars and I bet they taste much better too. I have made these a couple of times now and my husband says we don’t need to bother buying store bought granola bars anymore. They are great! I have added different things including chia seeds and flax seeds.